Manaslu Circuit Trekking 14 Days | Nepal Lion Tours & Trekking Pvt. Ltd. Manaslu Circuit Trekking 14 Days | Nepal Lion Tours & Trekking Pvt. Ltd.
Manaslu Circuit Trekking is considered as one of the most challenging treks in Nepal Himalayas. The Manaslu Circuit Trekking 14 days gives the adventurous with an unparalleled alpine experience. Manaslu trekking route opened for foreign trekkers in 1992 offering a rich Himalayan Cultural experiences. Furthermore, the Manaslu Trekking is offering a perfect combination of rich culture heritage, unsurpassed Himalayan beauty and a rich mountain biological diversity. Moreover trekking around Manaslu, where Manaslu Larkya La circuit and Manaslu Rupin La circuit lie is a tough trek. It requires a good experience of trekking and a good physical condition. 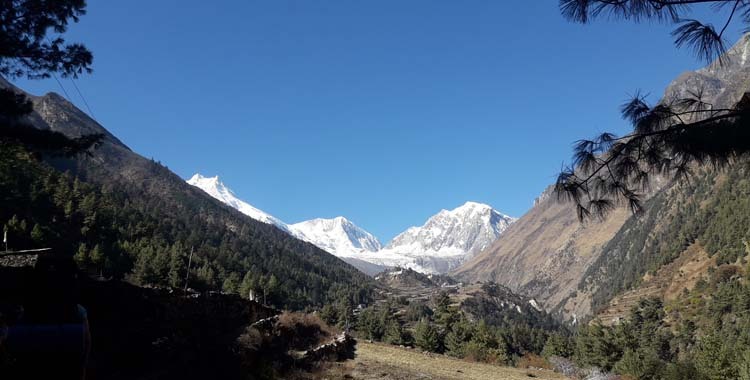 The Manaslu Trekking ascends through Budi Gandaki river to Larkya La Pass 5213m with attractive views of Himalchuli, Manaslu 8118m, Ganesh Himal and other mountains, beautiful varied landscape and different flora and fauna. Shorter duration treks are also possible in Manaslu Area Trekking. Mount Manaslu is lying on the East of the Annapurna range. Recently been famous to tourists and trekkers, Manaslu’s unsurpassed beauty and rich blend of Tibetan and Nepalese culture offer a true adventure for visitors to Nepal. Here you will also find the mountains and valleys covered with diverse and pristine eco-systems. Fantastic mountain views, rich culture, and genuine adventure tantalising trekkers as they climb to the base of Mount Manaslu. The inhabitants of the upper Manaslu trekking region are the Nuri. Their language and dress are quite similar to the neighbouring Tibetans. These local Himalayan people still earn their living through trade with Tibet. The mountain views from Nupri are sensational and crossing the Larke La pass is one of the most beautiful and dramatic of the Himalayas. Additionally, being similar to many other trekking routes in Nepal, Manaslu trekking has many routes to choose from. One option passes through Dudh Pokhari, a milky lake that is a common pilgrimage destination for Hindus and Buddhists alike. 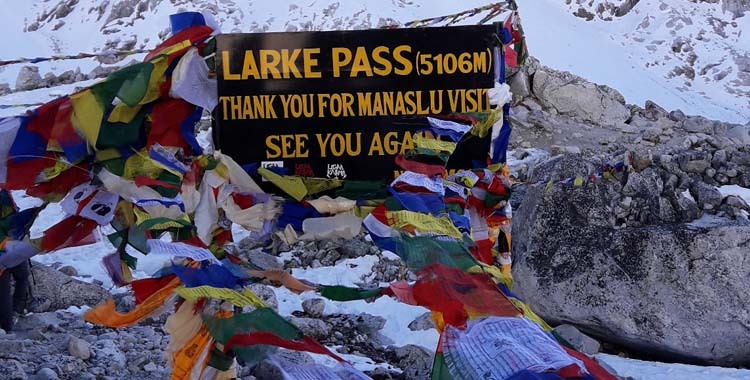 Another route takes you up to Manaslu Base Camp. While the most popular option is to trek over the Larke La pass to arrive in the Marsyangdi valley in the Annapurna region. Situated in Nepal’s Gorkha District and rising 8,163 meters, Mt. Manaslu lies just at the east of the extremely popular Annapurna Region and shares a fringe with its northern neighbour, Tibet. Opened to trekkers as of late, Manaslu’s top-notch excellence and rich social customs offer the committed trekker a veritable enterprise. Manaslu of the 28 Himalayan slopes of Nepal, Manasalu Himalaya is in the 12th Position. 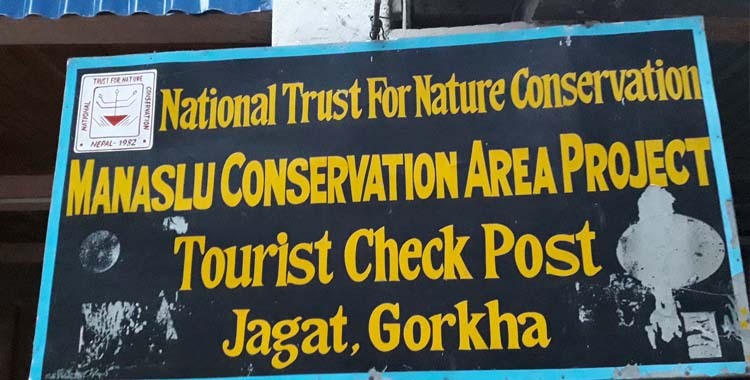 It is situated in the middle of Budi Gandaki River in the east, Dudh Khola a tributary of Marsyangdi River in the west, Larke la (go) in the North and Rupina La in the south. The vast majority of the mountain goes in Nepal take after the east-west course, however, Manasalu stretches out in the north-south bearing inside a solitary framework, this reach houses 40 crests over 5500m. The most noteworthy top of the extent is Manasalu (98, 163m). Manaslu, top 29 and Himalchuli have given or take comparative shape. We will be driving from Kathmandu to Arughat early in the morning. The landscape along with the lifestyle of the habitant changes radically as we proceed on. Arughat is a bustling town which is cut into half by the Budhi Gandaki River. We can enjoy the pleasant stay here and make the necessary preparation for the amazing trek next morning. Overnight accommodation will be in a lodge. to Budhi Gandaki Valley. As the elevation increases, the scenery undergoes a complete transformation, with white sandy areas along the riverside. Today’s trail passes through Ghap (2380m). We will be walking through west of Budhi Gandaki and crossing some waterfalls and Sringri khola on a funky suspension bridge. The trail then climbs steeply and traverses above Budhi Gandaki. The trail passes through a Kani with intricate, well-preserved paintings. On the trail, we may encounter some colourful birds including Dhafe. The trail climbs alongside the river, past two long Mani walls and the waterfalls. As we cross the Rhododendron forest before finally reaching Namring, we will be able to spot grey Langure monkeys swinging from branch to branch. Beyond Namrung, the trek enters into upper Nupri where the dialect changes to a form of Tibetan style and most people dress in chubas, the Tibetan style of wrapping around cloak. The trail leaves the village through a Kani and makes a long sweep into a wooded canyon and crossing the Hiran Khola on a double span cantilever bridge. One can now capture a spectacular sight of Manaslu, Manaslu North (7157m) and Naike Peak (5515m). The trail will pass through Lho (3080m), Syala (3350m) and we will have to cross a ridge and trek in and out of the canyon of the Thosang khola. We will then descend onto a rock-strewn moraine and reach Sama Gaon. Today we can visit the Pungyen Gumba. 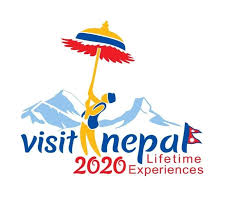 We’ll enjoy the sight of thousands of mani stones with Buddhist texts and pictures and the Sherpa women clad in traditional clothes and ornaments. On a little hill near the Sama village is an old Gompa (Pungyen Gompa), a monastery with great views of the glacier. As we continue on with our trek, the valley begins to widen. The route is an easy trail on a shelf above the river past juniper and birch forests and the stone huts of Kermo kharka. From a stone arch, you will be able to see a large white Kani. It gives an illusion of being close but will take you a long time to reach the Kani before reaching Samdo. Samdo is at the junction of three valleys. The trail descends into a wide, gentle land from Samdo, past many fields to a large Mani wall and a stone archway. After more than an hour of walking the trail becomes indistinct. We will be staying high on the trail that crosses the top of the two large ravines. Watch for the unique blue sheep as the trail gets steeper and climbs the side of a ridge to about 4460m. The trek today will test one’s endurance level and patience. We will trek to Bhimthang by crossing the Larkya pass. It might take 4 to 5 hours from Dharmasala to Larkya La and it is recommended to make an early start in order to cross the pass safely. It can be extremely cold and windy during the climb. However, the views are tremendous. 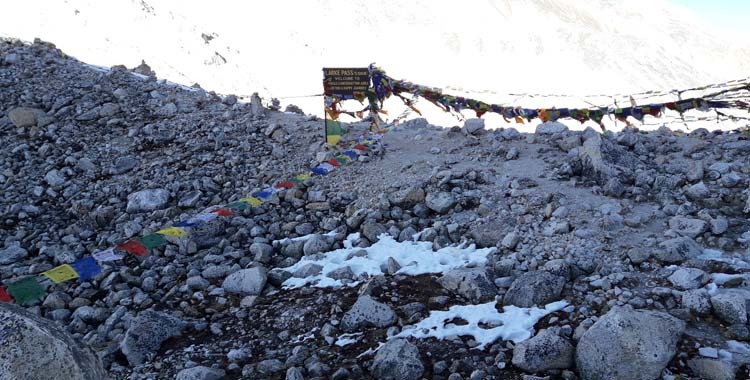 The trail descends from Bhimthang and crosses a glacial steam. The next two days’ walk follows on an ancient salt-trading route. We will be climbing over the side of the moraine and descending into a beautiful pine and rhododendron forest. The trail cuts across fields before making a steep climb over a ridge decorated with prayer flags. We will be proceeding through fields over a clear stream, past houses and more fields interspersed with rhododendron and oak forests. We will leave Tilje and walk up to Tal village. The day trek of about 5 hours follows the trail downstream of Marshyangdi River, passing through the scattered villages to reach Tal village. We will be climbing over the side of the moraine and descending into a beautiful pine and rhododendron forest. The trail cuts across fields before making a steep climb over a ridge decorated with prayer flags. We will then head through fields over a clear stream, past houses and more fields interspersed with rhododendron and oak forests. We will leave Tilije and walk down Jagat. Today the trail runs gently downstream of the river passing the village of Chamje and Himal Pani We then cross the bridge over Dudh Khola and climb up through a chorten-shaped arch, pass a mani wall and reach the Thonje village. At the village, we go through a police checkpoint and continue to Dharapani. We have entered the Annapurna circuit section from Dharapani. Further down, we come across Karte village and after quite a bit of walking we cross a bridge over Marshyangdi Khola. We also come across some mani walls before reaching the village of Tal, situated at the foot of a large waterfall. From here the road-building is full-on, so we’ll continue as far as we can get, and hop in our jeeps. But before then, one more steep descent through the woods, looking across the river to large waterfalls, leads us to the lovely cobbled village of Jagat, situated on a shelf which juts into the precipitous Marsyangdi valley. Descending steeply, we arrive at the small, somewhat wild-looking village of Bahundanda. We have a bumpy drive to Besisahar where we set up our last campsite and get ready for our last night’s party with the staff and porters in the evening! The trail runs gently downstream of the river passing the village of Naadi. From Naadi, the trail takes you to the bank of Marshyangdi River and a town of Bhulbhule, Khudi all the way to Besisahar We will walk up to Besi Sahar and take a ride to Besi Sahar and from there we will take a bus ride to Kathmandu. Domestic Airport picks up & drops by private vehicle. A challenging and adventurous trek, better suitable for adventure seekers. You will find this trekking as one of the most satisfying and engaging trekkings. Multiplicity of landscapes, ecosystem and culture within a short distance. Night camping outdoors, at the altitude of 3,000 metres or above.